Freezing my way through yet another arctic plane ride, I asked the flight attendant for a blanket. 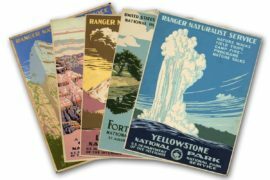 “We haven’t had those since the ‘80s,” he snapped and scooted away. It is rare to find pillows and blankets in coach class, and when you do, they are just recycled repositories for germs from passengers past. So I prefer to take my own to ensure a small measure of comfort. These are three pillows I’ve found that are worth dragging around the airport and onto the plane. The new JetComfy travel pillow attaches to your armrest. 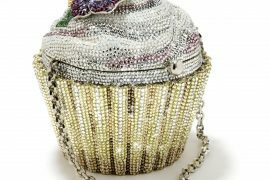 I’d never seen a product quite like this before. 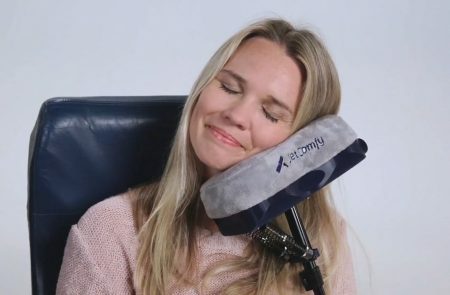 Jet Comfy was created by a two gentleman who met in a hotel bar in Tahiti, and after lamenting the uncomfortable flight they had endured, decided they could create a better travel pillow. This new product is designed to support your neck while in a seated position. The compact pillow extends, then attaches to your armrest where you can adjust it to a comfortable position. It has a removable microfiber cover over 2” of memory foam. As a bonus, it has two built-in power packs for recharging your devices. Comes in blue and grey: on sale for $49.99. The Cabeau Fold ‘n go Blanket is also a pillow. 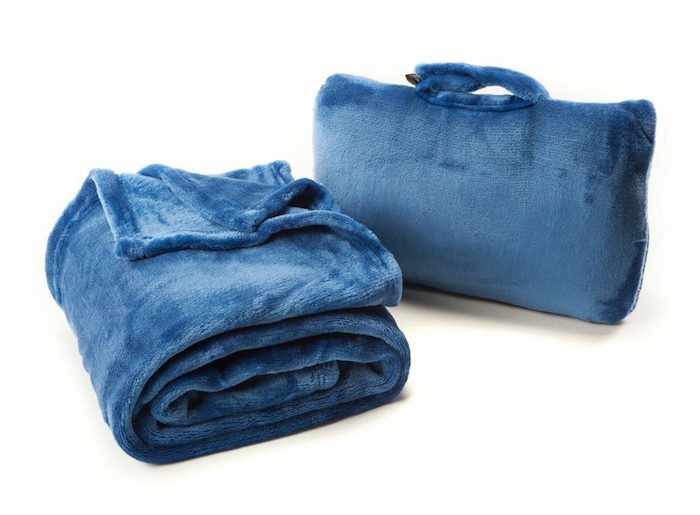 Made of high-quality fleece, this blanket wraps me in warmth. My favorite feature is that it’s also a pillow to perch under my iPad on my lap or put behind my back for lumbar support. A Velcro handle makes it easy to attach to my suitcase when it’s not in use. It’s machine washable, a mandatory feature for anything that touches the inside of an airplane. Comes in blue and charcoal for $19.99. 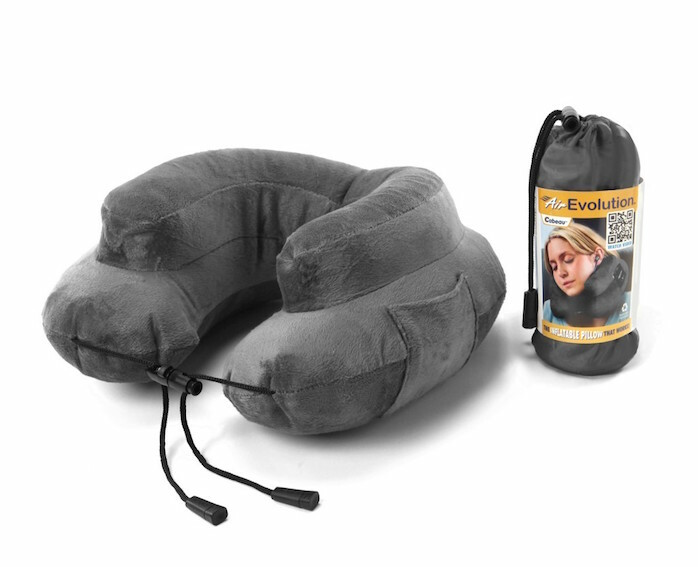 Thanks to the Cabeau Air Evolution I actually slept on my 14-hour plane ride to India. I was a bit skeptical about this double-decker inflatable pillow, but I love it. 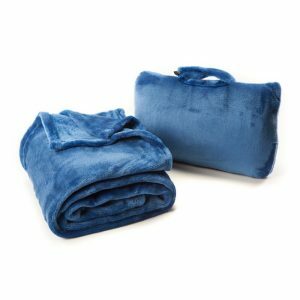 The raised sides offer support for my neck and the removable velour cover is super soft. There’s a media pouch to slip my phone or earbuds in and it folds down into the size of a soda can for easy transport. Comes in grey and blue for $19.99.